Eat, Move, Sleep is a lifestyle guide designed to help you make better choices for your health. It is written by Tom Rath – a New York Times bestselling author – who has been battling cancer for over twenty years. Since his diagnosis he has spent time every day learning about specific things he could do to improve his health. Now he wants to share these discoveries to help people lead a healthier and happier life. This book highlights the most proven and practical ideas from his research. 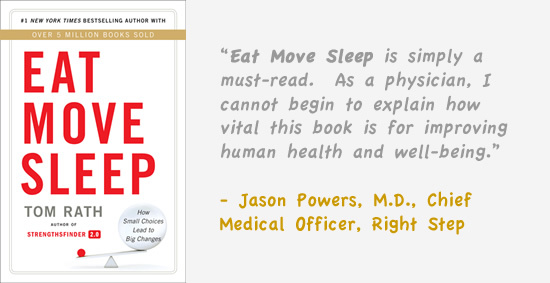 Eat Move Sleep will help you adopt positive lifestyle changes so that they become automatic. You will learn to make decisions today that will give you more energy tomorrow. When you make the right choices over time greatly improve your odds of a long and healthy life. Rath discovered that the vast majority of diseases – including cancer, heart disease, diabetes and obesity – are preventable. The small decisions you make every day can increase your odds of living longer and stronger. The actions that give you more energy and make you feel better in the moment also prevent illness in the future. The three elements – eating, moving, and sleeping – build on and support one another. When you eat healthy foods it is easier to exercise. Being physically active improves your sleep. Sleeping well makes it easier to avoid bad foods and so on. Consequently, it is easier to work on all three areas at once rather than focusing on them in isolation. Each chapter includes three findings and concludes with three ideas for how you can apply the information in your life. You are encouraged to challenge yourself to use at least one idea per day for the next month. If the challenge works you can continue to incorporate it into your daily life. If not move onto the next one and try something else. The goal is to create a plan that works for your unique preferences, lifestyle, and current state of health. Broccoli, kale, bok choy, celery, cucumbers, peppers, spinach, tomato, zucchini, carrots, apples, berries, avocado, almonds, pistachios, walnuts, chicken, pork, turkey, fish, tea. Eat, Move, Sleep explains that structured exercise is not enough to keep you healthy. Instead it is important to be physically active throughout the entire day. Walking in particular is recommended. For an extra boost to counteract aging it is recommended to engage in regular aerobic activity. As your fitness improves you can build up to 45 minutes of intense exercise at least three days a week. Eat, Move, Sleep: How Small Choices Lead to Big Changes retails at $14.97. Gradual lifestyle adjustments are easier to adapt to than sudden changes in routine. Focuses on improving health, rather than simply losing weight. Includes general advice for healthy eating. Emphasizes the importance of adequate sleep for weight loss and health. Does not require any specific diet or exercise regime. Appeals to dieters who prefer a flexible approach. Is not a structured diet or lifestyle program. Does not include meal plans or recipes. Some dieters will require more guidance to effectively lose weight or improve specific health conditions. Much of the information is targeted at those with only basic knowledge about diet and health. Eat, Move, Sleep is a practical guide to making lifestyle changes that have been demonstrated to improve health and wellbeing. When you make gradual adjustments in your routine it can be easier to solidify these changes over the longer term. This approach may work well for individuals who prefer not to follow rigid diets or a structured exercise regime.